Believe it or not, the Bills are not out of playoff contention yet. And with the rift between their front office and Rex Ryan it seems that's not the only contention they're still involved in. It would be a very Rex maneuver to be all but fired and somehow make the playoffs with a furious flourish to finish the season. Although it would also be a very Rex maneuver to be walking to the field, get distracted by a manicurist billboard, slip on some ice, blow out his ACL, vomit from the pain, and insist on coaching with a barf-stained shirt while hopped up on pain meds. Either way I think Buffalo gets the win. The Patriots are favored by 17 points in this game, which may seem fair at first bluff, but if you look into New England's previous games this season you'll find that the last time they beat a team by that much was Week 6. After seeing this I started to wonder if that line wasn't way too high, especially considering that they only beat the Jets by 5 points in their last meeting. Then I saw this play from New York's game against Miami last Saturday. Despite getting obliterated on that hit, Bryce Petty is reportedly going to start for the Jets this week. If Petty's o-line doesn't hold up any better this Saturday there's a decent chance we could see this before the game is through. The Jaguars finally fired Gus Bradley after yet another loss ran his record with Jacksonville to 14-48. Personally I hope Bradley gets another shot as a head coach, however when your resume says "Worst head coaching win percentage in NFL history" the interview is a real uphill battle from there. The good news for Bradley then? He has the second worst head coaching win percentage in NFL history. So not all is lost! (Things don't look promising for Burt Bell though) With a win here the Titans can set up a winner take all battle at home game against the Texans next week. And when I say "winner take all" the all in question is just the AFC South; so really, it's more of a "winner takes this" with the victor likely being treated to a first round playoff loss. Tennessee has been impressive in recent weeks though, and as long as they're present, meaning the whole team shows up with the proper equipment, they should get a win over the Jags (who I picked to make the playoffs before the season started; felt like it was an appropriate time to revisit that). The Packers have been red hot of late (with the exception of the majority of the 4th quarter last Sunday) and once again control their own destiny in the NFC North. However, some would argue that destiny by its definition is predetermined, and thus can not be controlled by anyone, even a team that's on a 4 game win streak. I agree with that assessment, but what those naysayers aren't taking into account is that Mike McCarthy recently visited a mystical shaman in Cheboygan that granted him the power to fully manipulate his own timeline, meaning that he is indeed in control of his own destiny. So far he's only used his new capabilities to bring back the McRib in select markets, but once he grasps the full potential of the influence he now wields the NFL, and to an extent all of us, will be in big trouble. The Browns are rapidly approaching the ignominious mark of 0-16, achieved by only the 2008 Lions before them. The Cleveland Indians have won a game more recently than the Browns, and only two more opportunities remain for Cleveland's football team to get off the schnide this season, otherwise the Indians will get their NEXT win before the Browns as well. While this week's opponent, the Chargers, have been a snakebitten franchise for much of the 2016 season, they can't really compare to the Browns, who were swallowed whole by a snake at the beginning of the season and have been getting slowly digested for the past 3+ months. As a result, I expect San Diego to get the win here. The good news is that if the Steelers win on Sunday there's a decent chance Pittsburgh won't have anything to play for when they meet Cleveland in Week 17. Finally someone on the Browns' level! The Redskins relinquished control of the 6th seed in the NFC with their dismal home defeat against the Panthers last Monday. Meanwhile the Bears maintained sole possession of the NFC's 15th seed with their last second loss to the Packers on Sunday. It was, yet again, the perfect performance for a team looking to secure a high draft pick: play well enough to encourage some hope in the future, but not so well that you actually win and move down in the picking order. Chicago has managed this feat in their last four losses, and I have to commend them on their efforts. However, I see a possible slip up coming here. Washington will be coming in a deflated team playing on short rest after their letdown on Monday. The Bears will be playing in their home finale, and possibly feel the need to give the faithful a nice gift for their troubles. It could be a risky move in regards to their draft position, but what better place than Chicago to throw caution to the ... wind? Yuck, I kind of want to just pick Washington now. Nope, it's Chicago. Why do I get the feeling that the Panthers will get the upset over the Falcons here? Well if you look at the Pythagorean expected win-loss totals for each of these ... Ya know what, I'm sorry, I just have to stop for a minute. He uh, he just keeps getting worse. Actually, this one is SO bad that I now believe he's trolling us. That has to be it. The only other explanation is that a grown man thinks a giant pink top hat looks good, and is an appropriate thing to wear while at work. There's only one person that that's true for, his name is Gaybraham Lincoln, and he's a bartender in West Hollywood who I assume exists. 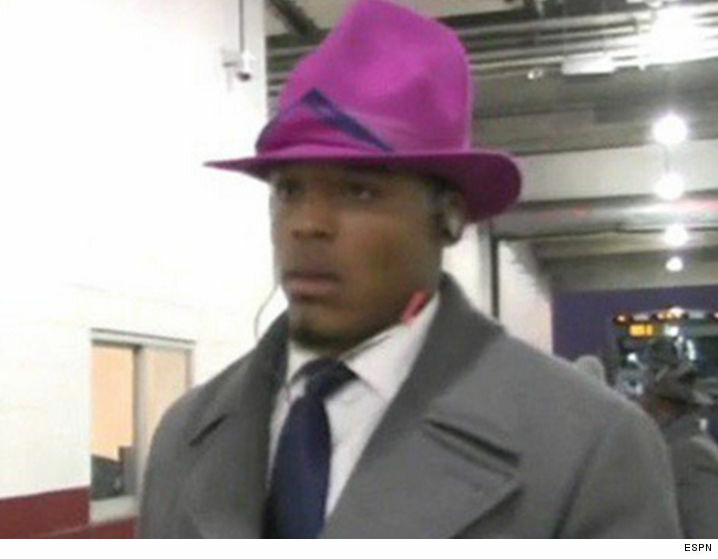 Ok, I just looked a bit further into it and it turns out Newton was paying tribute to Craig Sager, so I'll applaud Cam on this one. That still doesn't explain why he's been dressing like an Australian's nightmare for the first 14 weeks of the season though. I'm going with my hunch and picking Carolina. This one could be a barnburner, if it were in Indianapolis. Instead it's in Oakland where there are no barns. Perhaps "shootout" would be a more appropriate descriptor due to the fact that Derek Carr has taken all of his snaps from the shotgun or pistol formation since he injured his pinkie 3 weeks ago. Also Andrew Luck has at least two firearms on his person at all times, so yeah, "shootout" works better. Either way, there should be points a plenty, and I'm not just referring to awestruck children in the crowd pointing at the lofty passes saying, "Whoa, lookadat mama!" Though, that will happen frequently as well. Both teams need a win, and while the Colts may be more desperate, they just aren't as good. These TWO teams met only TWO weeks ago in a game that featured a TWO point safety and is one of only TWO games in NFL history to end with a final score of 16-11. You thinking what I'm thinking? Deuces wild! You wondering what I'm wondering? What the hell does that mean?!? Hmm, ok maybe whoever wears #2 on each team gets TWO plays in the game in which they get to be an extra man on the field. Just checked, neither of these teams have a player who wears #2. Well then you assign it to someone for just this game damn it! I don't care about league restrictions. Deuces wild! That's the idea, and that's what we're sticking with! It's a good idea! It's smart! And it's funny! (Oh God, don't do this. Get it together. Wipe the tears from the keyboard and get back to it. Oh great, the keyboard's not working because the moisture short-circuited it. Awesome, I get to go back to Staples again and buy another new keyboard and have Carl give me that look. Well guess what Carl, you're a Staples sales associate, so shut up! Save it for your cats! Wait, if my keyboard short-circuited how am I typing this. Am I even typing it? Where are we ...?) I'll take Tampa. Going into the season it was thought that this game would be for the NFC West title, and in a way it still is. If the Seahawks win they'll retain their 2016 NFC West title, and if they lose, they won't give it up. Ok, so I guess it's akin to a non-title match, but hey at least the champ will be involved, so there's that! Seattle still has something to play for as they try to finish 2nd in the NFC, and while their offense has been maddeningly inconsistent for much of the season they still average 28 points per game at home, a location where this game is, in fact, being played. Couple that with the fact that the Cardinals gave up 48 points at home last week and it seems like the defensive intensity may not quite be what it was in these teams' epic 6-6 tie from Week 7. Hollywood! Movie stars! Glitz! Glam! Yeah LA's got it all, but would you believe that the hottest ticket in town is this Week 16 clash between the 49ers and the Rams? If you said yes, I admire your optimism kid, but in this town it ain't gonna last, and it's about time someone beat it right out of ya. This game's a flop I tell ya, the script was shot from the beginning. Then the Rams cast the wrong leading man, and told their director to hit the bricks; this project's gonna sink the whole studio. And don't get me started on the Niners. Sure they were a B picture to begin with, but trying to resurrect Kaepernick's career? Look, the kid had something once, but whatever it was it ain't there now, and wherever it went ain't worth going to find it again. Ya dig? The only option now is to just scrap any and all domestic showings of this game and see what you can recoup overseas. Look, I know you're still hopeful this show can be a hit, but forget it, it's Niners/Rams. This season the NFL scheduled the Steelers to play on Thanksgiving and Christmas. Is it really that Pittsburgh is that big of a draw? Or is it more likely that the Steelers just hate their families? I'm guessing it's the latter, and that the team requested to play on any and all available holidays for fear of having to spend time with all of the lame-o's on their lives. I mean, in-laws, am I right? Regardless of the reasoning behind it, this game IS on Christmas, and it's of the highest importance. A Steelers win wraps up the division title for them, while a Ravens W would put them in the AFC North pole position. In this intense Christmas clash the Claus will be out. We'll all be waiting with baited breath to see if you do indeed get that santa hat CriColl. Last week we looked at the Lions' remaining schedule and discussed the possibility of them losing out and missing the playoffs. Well, I discussed it, you just sat there like a log contributing nothing to the conversation. No, not a yule log, this is the pick for Monday, Christmas is over, move on! Now that we got that out of the way I can return to my original point, Detroit was going to lose their final two games and be left hoping that Tampa lose out as well. But now that the Cowboys have clinched home field advantage throughout the NFC playoffs they just pack it in on Boxing Day.